Outside shooting is paramount when it comes to international basketball. That cannot be overlooked. 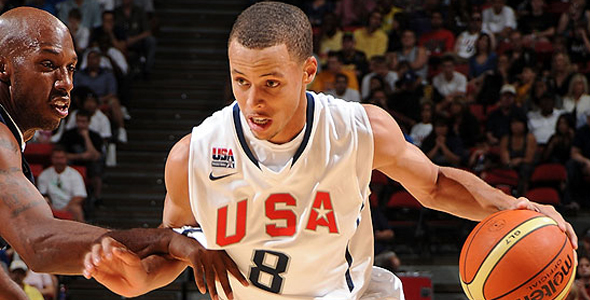 That is the main reason why Golden State Warriors Rookie of the Year runner up, Stephen Curry, was invited to play for the U.S. this summer. He is a knock down shooter who can also put the ball on the floor. If you’ve been paying attention to what has been going on with this team, you’ll know that saying that this team has been ravaged with injuries would be a monumental understatement. Steph Curry is next up. Yesterday during practice, Curry landed on the foot of a teammate and rolled his ankle. Judging by Curry’s initial reaction, it was thought that it was very serious, but the team’s athletic department later determined that there was no structural damage to the ankle. However, if you’ve ever experienced rolling your ankle before, you know that you have to walk gingerly on it afterwards, let alone run on it. The team takes on Lithuania on Saturday and they’re not sure if Curry will be in uniform. That is still an exhibition game, so I would rest him. I would actually rest him until I got to Turkey if I were Coach K. But then again, Curry, Eric Gordon and Russell Westbrook are battling for the final roster spot on this squad. They don’t have to cut the final guy until two days before the tournament begins. Even so, I don’t see any conceivable way that Curry is left off over those other two guys. Neither Gordon nor Westbrook possess the outside touch that Curry has and without Curry, this team would be lacking in that department. Losing Gordon or Westbrook wouldn’t make them any worse. So I don’t think resting Steph should hurt his chances of making that final roster spot. Not only have a slew of players been forced to withdraw already, but Kevin Love is nursing a sore calf and Danny Granger has an injured finger and bruised thigh. Let’s hope the team even has 12 guys to suit up when August 28 rolls around. If you’re looking for your everyday, predictable basketball talk, then go somewhere else, because Kevin Burke of The Kevin Burke Project brings provocative, thought provoking content about basketball as only he can. Kevin also hosts The Hoop Doctors weekly podcast show, which you can subscribe too for free on iTunes.